We usually think of alcohol being something that young adults have problems with. But alcohol problems in older adults has been called the "silent epidemic". This is because harmful drinking in older adults is much more common than people realise. 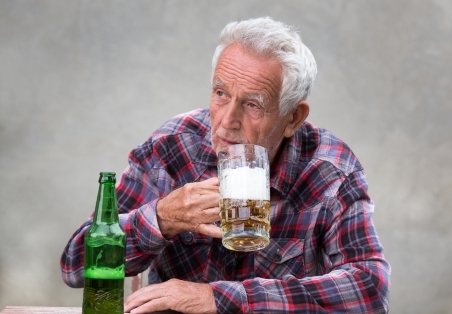 Older adults tend to drink more frequently than younger adults. But they have smaller quantities when they drink. They're also more likely to drink at home. Some cases of harmful drinking in older adults come from a lifelong pattern of drinking a bit too much. When these people get older, their excessive drinking starts to catch up with them. Other people develop drinking issues later in life. This might be after a stressful event like a bereavement. It could also be after they become the caregiver for an unwell partner. The problems caused by excessive alcohol in older adults are different to those of younger people. Older adults may have multiple health problems or take several medications. This can make the effects of alcohol more unpredictable. Older bodies also tend to manage alcohol less effectively. This means that an amount of alcohol that would be fine in a person 20 to 30 years younger, can be harmful in an older adult. It can be hard to work out how much of an older person's health problems is caused by alcohol. It's hard to know how much an older person can safely drink because every older person's state of health is different. The important thing to realise is that most older adults shouldn't drink as much as younger adults. They should also reduce the amount they drink as age, health concerns, and medications change with time. There are several types of risks if older people drink too much. Falls, with more serious consequences than for younger people. These include head injuries with brain bleeds, broken bones, and lacerations. Confusion, loss of memory, worsening concentration, and a negative effect on mood. Worsening of health problems like insomnia, diabetes, dementia and liver disease. Interactions with medications can lead to falling more often or becoming confused. They can also make the medication stay in the person's system longer or be less effective. This 19-page booklet has comprehensive information and advice about alcohol and older people, including the problems it can cause, how much you should drink and who can help if you have a drinking problem. Information about a programme for people aged 65 and over who are concerned about their use of alcohol and other drugs. Health Promotion Agency – Alcohol and older adults in New Zealand, a literature review, retrieved July 2018.